When you think of being stuck in your house on a rainy day, what do you typically imagine? Maybe it involves your kids staring at a TV screen watching the same old movie they’ve seen a thousand times while staring longingly out the window. Well, why not mix up your routine and take your little ones to a place that’ll serve up some much-needed fun without requiring you to do all the cleanup afterwards? Luckily, that’s precisely what you’ll find in Volkswagen Lee's Summit’s guide to the Best Family Fun Activities near Lee’s Summit, MO. So, pack up the car and head to these delightful destinations. Your children love to exercise their imagination in any way possible. At Hallmark’s Kaleidoscope, your tiny tots will be provided with everything they need for a day of fun. This entertainment emporium utilizes materials from Hallmark’s card manufacturing process, from papers to decorations, and everything in between. That way, your child can create a masterpiece that’s ready to hang on the refrigerator door and enjoy every minute of their free 50-minute Creative Art Session. On top of that, this destination offers up different ways for kids to design their artwork, whether they want to use paint, colored pencils, crayons, or anything else. Thanks to their puzzle-making machine, your little one can transform a unique cardboard creation into a jigsaw puzzle for your family’s next game night. To secure your family’s spot at this imaginative haven, all you have to do is check their calendar and pick a day for your exciting outing. Check out their Facebook for some fun pictures of visitors showing off their artistic inventions! Regardless if you’re the parent of a toddler or a teenager, you still need to come up with ways to keep the whole family free from boredom. Well, Paradise Park has the answer to your entertainment prayers with their almost endless list of attractions. 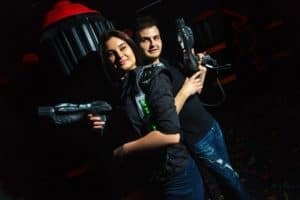 For example, your younger kids will love the Foam Factory, which provides everyone with soft, foam balls to fire with canons, blasters, and geysers. Plus, they’ll chase down their opponents through cargo nets, tunnel slides, and platforms, making their experience even more memorable. If you’ve got a few teens tagging along, buy a couple tickets to the indoor/outdoor Laser Tag arena. During this game, your kids will traverse the multi-level center with their friends to compete against another team. In addition, this hotspot offers up family packages, including the option to dine at their outdoor picnic tables or campfire. That way, your next family adventure or reunion will be adorned with plenty of diversions for people of all ages. Don’t forget to view their upcoming events on their Facebook page! Looking for some family bonding time? If so, try working together as a team at TrappedKC. At this labyrinth of riddles and puzzles, you and your kids will attempt to crack the code on these escape rooms and make a dramatic getaway. No matter what age your kids may be, this mind-bending venue provides you with lots of room options, all of which vary in difficulty. So, whether you prefer to solve a mystery or escape Treasure Island with some buried treasure, you and your loved ones can choose the theme that fits your particular tastes. Furthermore, booking your trip to this locale is simple. All you have to do is visit their Book Now tab and choose the date and time of your visit. Then, select the number of adults and children playing, and you’re ready to go! Take a look at their Facebook profile for specials on their tickets!